I don’t know what’s worse, the guilt or the repercussions. Probably the guilt. Yet so far the guilt count is 0 and I’m ignoring all repercussionary twinges. Because doggone it, I was in taste-bud heaven. Most of this was served in our own hotel as part of the price. Monstrously unfair. We did do a lot of walking in the 90F+ weather and got our exercise. Stupid? Maybe. It was a dry heat, mostly. We were well-watered and sunscreened up to the hilt. Evenings dropped to about 84 or so. Nice. Here’s where we were: Prairie du Chien, WI. 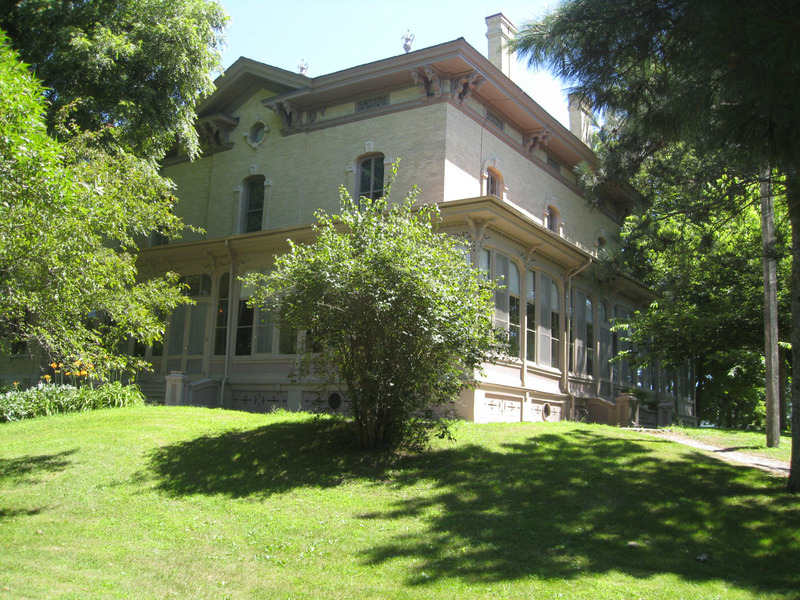 One of our favorite places to visit is Villa Louis, the most beautiful cream-city brick Victorian house ever. Another is Wyalusing State Park. And look, you can cross the Mississippi and there you are in Iowa, specifically McGregor, IA, which has fabulous little shops that range from touristy to not at all. We prefer the latter, especially the Victorian dry goods stores and antiques. Anyway, I survived being heavily unmacrobiotic. But I’m finding I’m rather disinclined to jump right back into the brown rice and soy and tofu and fake!chicken bits. Is it because salt, grease & wonderfully deep fried foods are seriously addictive? Or did I need this overdose of iodine? How far can I take this justification?? Gaa!